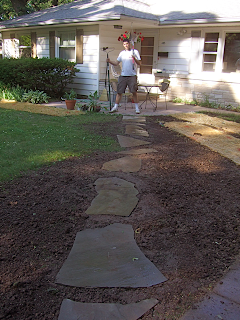 This is the last part of the vision for the front yard: a flagstone walking path leading from near the corner of the driveway to the patio in the direction of the front door. This creates a pathway away from the main entrance out to the sidewalk and street. The stones are New York Bluestone. Now the plan is to grow some grass in all that ugly dirt.